Modacrylic fiber is a manufactured fiber in which the fiber forming substance is any long chain synthetic polymer composed of less than 85% but at least 35% by weight of acrylonitrile units. (-CH2CH[CN]-)x. A modacrylic is a synthetic copolymer. Modacrylic fiber is inherently flame resistant. Although it burns when directly exposed to flame, it doesn't melt or drip and is self-extinguishing when the flame is removed. Modacrylic is widely used in high performance protective clothing, such as firefighting turnout gear, because flame resistance is combined with other desirable textile properties such as durability and good hand feel. Modacrylics are soft, strong, resilient, and dimensionally stable. They can be easily dyed, show good press and shape retention, and are quick to dry. They have outstanding resistance to chemicals and solvents, are not attacked by moths or mildew, and are nonallergenic. Among their uses are in apparel linings, furlike outerwear, paint-roller covers, scatter rugs, carpets, and work clothing and as hair in wigs. Modacrylic fiber is chemical resistant. It retains its strength in concentrated acid/alkaline environments, which is useful for certain types of industrial filtration. Modacrylic is also on the extreme negative end of the triboelectric scale, and when combined with another more positive fiber such as polypropylene, results in a triboelectric media with improved filtration efficiency. Modacrylic fibers are made from resins that are copolymers (combinations) of acrylonitrile and other materials, such as vinyl chloride, vinylidene chloride or vinyl bromide. 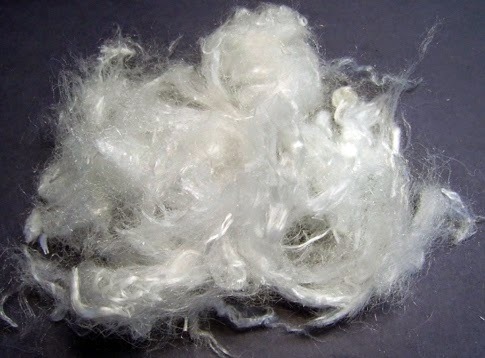 Modacrylic fibers are either dry spun or wet spun. The low softening temperatures of modacrylic fibers allow them to be stretched, embossed and molded into special shapes. The fibers may be produced with controlled heat shrinkage capacities. When fibers of different shrinkages are mixed in the surface of a pile fabric, the application of heat develops fibers of different lengths, producing a surface that resembles natural fur. Apparel: Deep-pile coats, trims and linings, simulated fur, wigs and hair pieces, children's sleepwear, career apparel. Other Uses: Filters, industrial fabrics, paint rollers, stuffed toys. Machine wash in warm water and add fabric softener during the final rinse cycle. If dryer is used, use low setting and remove articles as soon as tumbling cycle has stopped.